Taking a defensive driving course comes with many benefits. That being said, so does running five miles every day. In both cases, while we know they’re good for us, neither activity is not necessarily something most of us would jump into with gusto. If you did decide to incorporate running into your daily routine, you would probably prefer to do it on a temperate day free from wind on a gentle downhill slope. 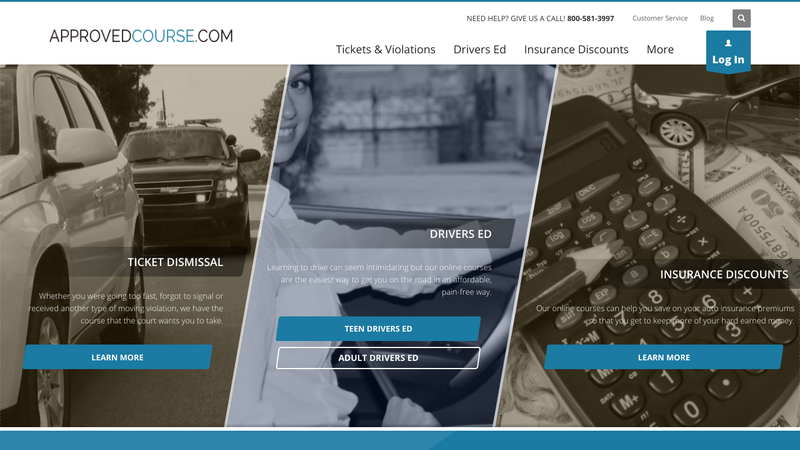 ApprovedCourse.com promises a defensive driving experience with these types of advantages, but do they deliver? First, a little background on ApprovedCourse.com. While the course they offer is a fairly recent entry in the online defensive driving space, it is built on years of industry experience. 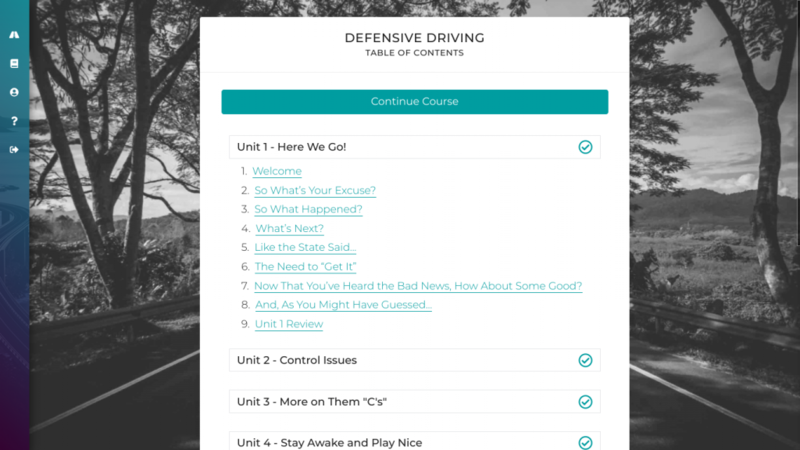 The author of the course began his defensive driving career in the late 90’s as a classroom instructor with a company called “A Sense of Humor Defensive Driving.” During the years of his tenure, he honed his craft of communicating material that, let’s be honest here, ranges from dry to downright boring, in a way that was both engaging and entertaining. Over the years he has authored five driving courses including the one offered by Approved Course defensive driving. The name Approved Course actually does double duty. It is not only the name of the company’s TEA/TDLR approved defensive driving course but also of the company itself. The ApprovedCourse.com website is currently home to driving courses recognized in nearly every state with plans to expand into other “approved courses” in industries such as hospitality, education, medicine and real estate. But you came for a defensive driving course review, so here it is. As with any endeavor, you can’t get finished if you don’t get started, and ApprovedCourse.com makes it easy. With only minimal information required, their secure payment site will have you registered and in the course in a matter of minutes. The ApprovedCourse.com registration process is simple and secure. Once you’re in, you’ll encounter the following easy-to-navigate interface. This will be your jumping off point any time you log in and out of the course. By the way, the course will allow you to log in and out as many times as you wish for the duration of the course. This makes the whole experience customizable to your busy schedule. To continue the course after a log out, simply use the drop down menus within the table of contents to return to where you left off. The completed pages will be marked on your return to eliminate any guesswork. As seen above, each of the eight course units is broken down into pages for you to work through. The pages contain a mix of text, graphs, images and video designed to convey the required information in the most efficient and user-friendly way possible. Compared to other courses we have seen, defensive driving with Approved Course is among the best at making this process as painless as possible. ApprovedCourse.com employs a user-friendly mix of text, video and graphics to keep you engaged. As you can see, the text is broken into manageable chunks on an interface that is easy on the eyes. Further, there are videos on many pages to communicate the information to you with even less effort. The videos used in the Approved Course curriculum come from a variety of sources both old and new. The course text refers to many of them as “vintage” in a tongue-in-cheek sort of way. Student opinions about these videos are mixed; some people love them, others clearly don’t. In reading the reviews, it’s a little amusing that one of the main arguments against the old videos is that they “don’t relate to today’s driving environment.” The truth is, whether it’s 1950 or 2050, driving without a seatbelt can get you thrown out of a car and driving like a jerk can get you run off of the road, so we don’t really see the problem. After any course video over 60 seconds in length, there will be a question about the content of the video. This is a built in state requirement. You will only be given 90 seconds to answer the question, so stay sharp. If you answer incorrectly or the timer expires, you’ll get to watch the video again and take another shot. Fortunately, compared to some other courses we’ve seen, the clearly worded, multiple choice video questions on ApprovedCourse.com should save you from watching things more times than you need to. Another advantage of Approved Course Texas defensive driving is the use of unit quizzes in the place of a final exam. One of the drawbacks of online defensive driving is that, with unlimited opportunities to log in and out, you might be tempted to take a little longer to complete your course than is absolutely necessary. That’s all well and good until you have to pass a final exam that contains questions covering material that you haven’t seen in days (or even weeks!). This is where ApprovedCourse.com has a real advantage. Their TEA features short, multiple-choice exams at the end of every unit. While this means you’ll technically have to answer more questions successfully to earn your certificate of completion, they will only cover information you have just seen. To make passing even easier, John, the “host” of the course, appears in a review video immediately prior to the quiz. He does a great job covering everything (and, yeah, we mean everything) you’ll see on the upcoming quiz. It’s virtually impossible to fail when you are practically handed the defensive driving answers before you even see rthe questions! 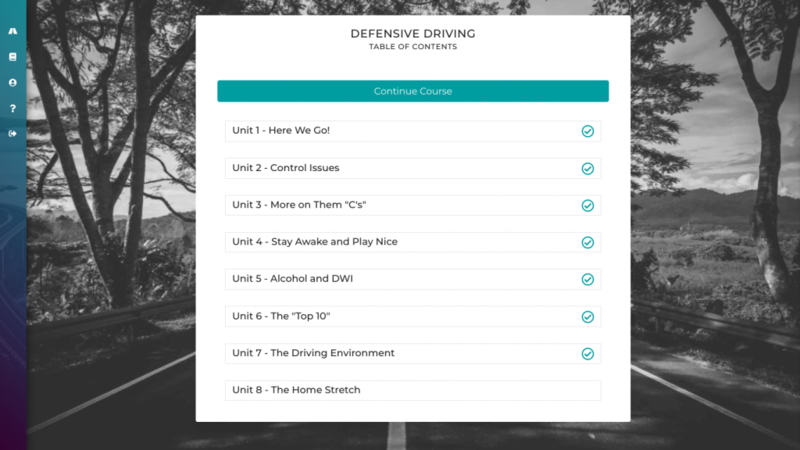 This feature alone puts Approved Course way ahead of many of the other online defensive driving courses out there. All This, and Printable Defensive Driving Certificates, Too! As we have already said, taking defensive driving is not at the top of most people’s to do lists, so it should come as no surprise that most people wait until the last minute to do it. This procrastination results in a big jump in the cost of dismissing a ticket. The court wants paperwork returned by a certain date so, for a lot of people, waiting means having to pay for expedited delivery of their defensive driving completion certificates. Many companies take advantage of this by charging outrageous fees for overnight delivery through FedEx or UPS. If you need your completion certificate quickly, ApprovedCourse.com has you covered. What beats overnight delivery? How about “right now” delivery? 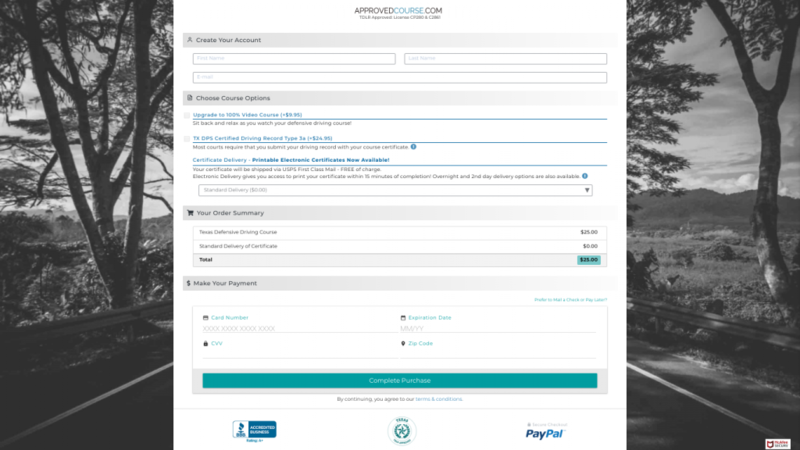 ApprovedCourse.com offers defensive driving with a printable certificate for less than half the price of traditional overnight delivery. This way you can have your certificate in hand and ready to get to the court without having to wait around for a brown truck.